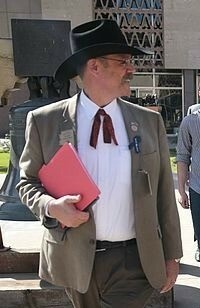 Rep. Mark Finchem likes to dress up in cowboy hats, rawhide jackets, and Colonel Sanders ties. He’s from Michigan and imagines it’s a very “Western” look. Arizona Rep. Mark Finchem (R-Oro Valley) wants to sell the Grand Canyon to pay the state’s debt. That’s not the only bad idea he’s come up with since representing Oro Valley and Marana in Legislative District 11 since 2015. He injects his religion into legislation, he opposes gun safety measures, disputes reproductive freedom for women, votes against veterans, and fights against public schools. Who represents Legislative District 11? The district has one state Senator, and two Representatives (all Republicans). One of them is Arpaio endorsed, 57-year-old Mark Finchem. Who is Mark Finchem and what motivates him to make that miserable drive to Phoenix three days a week? I found out. He is running against retired Air Force Colonel Hollace Lyon. See Retired Air Force Colonel Hollace Lyon Offers a Consensus-Building Vision as a State Representative In LD11. Professional Life: Mark Finchem has held many jobs. However, he spent most of his professional life (20 years) working as a cop in…. wait for it…. Kalamazoo Michigan. It was also here that Finchem earned an Associate’s Degree in criminal justice from Kalamazoo Valley Community College in 1984. Finchem also had a stint as a firefighter, public safety officer, and airline employee; he has four grown children. Upon touchdown in Tucson, Mark Finchem landed a job at Intuit a local software company and rose through the ranks. He now supports himself and his family as an independent real estate agent and can be seen in the Phoenix capitol and at Tucson events adorned in his large cowboy hat, rawhide jacket, and “Colonel Sanders” tie – that I imagine guys from Kalamazoo Michigan think is very “Western” …. but is actually anything but western. What Motivates Finchem and How he Votes: Mark Finchem is surprisingly well spoken for possessing only an Associates Degree. I can easily see him moving up in Arizona Republican politics at a rapid pace. If we are not careful, he may soon be Senator Finchem. Finchem eagerly describes himself as throwback Constitutionalist. Finchem recently told the Maricopa Monitor: “I think the three things most important to people today are personal freedom, economic freedom and a debt-free future.” We should also recognize that Christianity is core to his political philosophy – it is in every one of his official websites, digital campaign ads, and interviews. Gun Safety: NOPE. Mark Finchem is going to “Stand and Fight,” just as the NRA has commanded he do. He is a card-carrying member of the NRA, a vocal supporter of the idea that most anyone should be able to own whatever weapon they want. After the public execution of over 50 human beings in Las Vegas, Mark doubled down on his NRA dogma, going on a Twitter rant insulting everyone from Senate Majority Leader Mitch McConnell for daring to be open to reform, to President Obama. He Tweeted: “Hey Mitch you do understand what inalienable means right? More than ever Americans deserve the right to be armed stay armed and live free.” Finchem even went on to suggest that President Obama move to a different country. I am a combat Veteran of the Iraq War, and I, like most Americans, support comprehensive gun reform, and I have thousands of fellow Veterans who feel the same; we are #VetsForGunReform – he should look us up. State’s Rights – Finchem has a separate tab on his campaign website devoted solely to the subject of State’s Rights. Bottom line: he is a 1700s Constitutional fundamentalist. He’s kind of like a toxic cocktail of Sen Rand Paul and former Arizona Senator Barry Goldwater but with a huge dose of dripping religious morality thrown in. Selling off federal lands: Yep, Finchem wants to sell off federal land, to include the Grand Canyon to pay off Arizona’s debt. Finchem has sponsored and co-sponsored multiple House Bills which call for Arizona to sue the federal government to place control of these lands back in the hands of Arizona. He plans to fund public schools by selling parts of these lands off. Yes – you read that right. 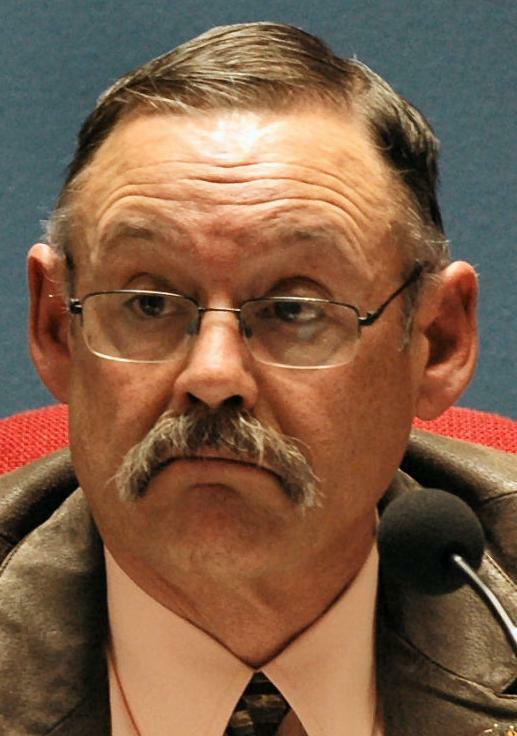 Arizona Veterans: On paper, it seems like Mark Finchem would support Arizona military veterans in any way he can, but recently he voted no on a Veterans memorial (SB1431) to honor Arizona veterans lost to suicide caused by PTSD, or Traumatic Brain Injury (TBI). In 2018, it seems pretty unbelievable and backwards that a politician would not adhere to scientific facts, that clearly consider PTSD or TBI in soldiers to be a combat injury. I can only assume he, like so many other radicalized Christians, arrived at this conclusion from his fundamental Christian beliefs. SAD BIGLY! Why Mark Finchem Matters: Many low-level state legislators like Mark Finchem go on to seek federal office – and Mark Finchem fits this new mold of radical conservatism that so appeals to the current Republican Party very well – he is dangerous. The Arizonans of Oro Valley and Marana deserve more, the people who live in Legislative District 11 deserve a Representative who believes in basic science and facts – who is comprehensive in their political and social views. A leader who understands their struggles and grasps the complexity of our ever- evolving world and how these changes affect the dynamic communities of Oro valley, Marana and the surrounding area. Finchem likes to quote Bible verses on Twitter and like any Christo-Conservative Republican, he also likes to insult President Obama. But it was President Obama who said: “Hard problems are hard”. President Obama is right – hard problems are hard, and Mark Finchem’s political philosophy is lazy. His views are not well fleshed out, and often dogmatic; dripping in religiosity. Finchem’s political positions better represent a 19-year-old, college freshman, high on Ayn Rand’s gibberish, toying with the limited ideas of Libertarianism – instead of a 57-year-old Statesman. Let’s give Mark Finchem, the “Colonel Sanders” tie wearing, ten-gallon hat sporting, radicalized, Fox News, AM Talk Radio, Zombie Loon, the boot this November. Where is Arizona Legislative District 11? When viewed on a boundary map, LD 11 is geographically one of the largest Legislative districts and has a population that is literally growing at an exponential rate by the minute. LD11 consists of Oro Valley, Marana, Picture Rocks, Avra Valley, Red Rock, Picacho Peak, a bit of Eloy and parts of Casa Grande. 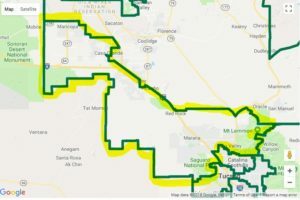 Let’s first break down the most vital parts of Legislative District 11 – Oro Valley and Marana. Maricopa: This city in the Gila River Valley has 46,903 residents as of 2016. Up to now it’s been a Republican stronghold, but that may be changing. Maricopa is a growing city where the median resident age is only 35.6 years and the per capita income jumped from $9,175 in 2000 to $26,352 in 2016. Maricopa is the second most populous incorporated city in Pinal County and 18th most populous in Arizona. Hispanics compose 25% of the population and African-Americans make up 10%. It is secular with 78% declaring no specific religion. Oro Valley: Oro Valley, population 43,781, is perhaps one of the fastest growing and diversifying regions of Tucson. According to the 2010 Census, Oro Valley’s population increased by 29,700 residents in 10 years’ time. Oro Valley has been dubbed an “Upscale Tech Mecca” and has a median household income 50% higher than the national average. Oro Valley is known for its ever-growing number of retirees from the Midwest and East Coast who flock down from their sleepy and gated community of Saddle Brooke. Marana: Marana or “thicket” in Spanish, is a whole other beast – Marana is the 4th fastest growing city in all of Arizona! Population 43,474, Marana has something for everyone – sparkling new outlet malls, the upscale Ritz Carlton, Dove Mountain luxury golf community, industry, huge mines, building companies, as well as a maze of well-groomed strip malls. However, there is something that places Marana apart from Oro Valley – its non-white population. About 30% of folks from the “thicket” are Latino, Native American, African American, Asian, and Islander. Local politics matter. If the 2016 presidential election has taught us anything, it is that local politics matter, and they matter a lot. Trump’s ascension to the White House sparked political activism in Americans like never before. According to the Washington Post and the Kaiser Family Foundation, an astonishing 1 in 5 Americans have participated in a major political protest since Trump has taken power, and many more have joined formal political activist organizations. These are Americans who have never before been involved in politics and who were definitely not activists. When it comes to local politics, organizations like Resist, Indivisible, which has a chapter in every congressional district in the nation – to include Southern Arizona), Everytown, March for our Lives, and Moms Demand Action, are drilled down so deep on local politics that they are even excited about who is running for Mine Inspector. Several special elections have taken place in our nation in which Democrat candidates have pulled off stunning victories in places that are so red, that the Democrat Party often doesn’t even bother running a candidate – we saw this play out in Virginia, Pennsylvania, and even Mississippi. Arizona has its own election coming up on November 6, 2018. Be sure to register and vote out this right-wing hardliner. I dislike many things in Finchem’s voting record, but the insult to a community college education is totally unnecessary. Smacks of elitism. He’s a lousy real estate agent, too. I had a minor encounter with him several years ago and he treated me with total contempt. I would never go near him or any of his clients again. By the way, how do your ad hominem attacks sit with the candidate you support, Hollace Lyon, who you imply is a consensus builder? Does she know that this is the way you promote her and her consensus building, with sophomoric insults? Holy smokes, dude! You started your rant about sophomoric insults with a sophomoric insult! You really need to put more thought into your posts JohnBoy, because that is some epic irony right there. I look forward to cocktails at the Trump Grand Canyon and Casino. At least until it goes fins up. The good ole boys get worse with each passing year. And this “pretend” cowboy is from Michigan?? When will they evolve into the 21st century? Vote them out!